Currently you can download a 51-page Free Genesis Copywork Set on Currclick.com. Each of these copywork pages is a verse from a chapter in the book of Genesis (ESV Bible). There is one verse for each chapter, a total of 50 pages of copywork. This copywork is designed for a beginning writer. The lines are about 5/8th inch tall with a mid-line to help your child position their letters correctly. These pages would work perfectly as an accompaniment to your ancient history studies. They would also be great to take to church if you will be hearing preaching from the book of Genesis. Children who are not old enough to take their own notes can copy a verse from the chapter they are hearing about. Lastly, they would also be great just as handwriting practice for any child who needs it! I would like to note that some of these verses are not complete. Only a certain amount of words can fit on a page with this larger type. I have tried to pick sections that fit the point of the particular chapter. Copywork is a fantastic way to help your child master reading, penmanship, grammar, and spelling all at the same time, simply and subtly. 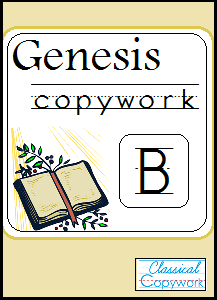 Click here for the Free Genesis Copywork Set.